The seasons have changed and it’s getting nippy out there! If you’re anything like me, cycling suddenly feels far, far less inviting and much harder than it did when the weather was warm. Having just returned from a sunny cycling holiday in Catalunya where the temperatures hit a rather perfect 28 degrees, getting out and cycling in temperatures nearer to eight degrees is taking a little more effort (OK, a lot more effort). Some days I need a good talking to (read that as most days). 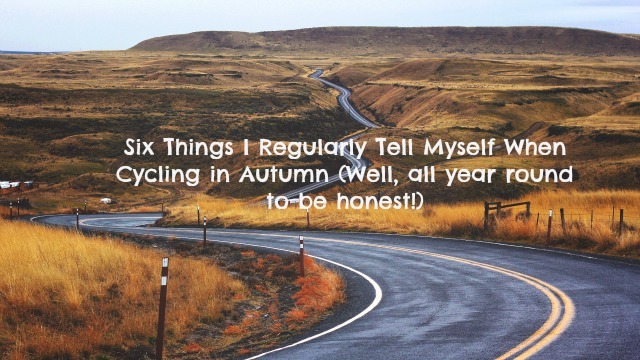 So, here are the six things I tell myself whilst cycling in Autumn. I say in Autumn; what I actually mean is here is my inner monologue all year around! 1. I CAN do this! I know I can do this, but my legs are telling me I can’t, so aside from telling my legs to shut up, I find shouting ‘I CAN do this!’ in time to my cadence when things are feeling particularly tough is pretty effective! ‘Can’t’ is not in my vocabulary…not out loud at least! 2. This is the MOST fun I have ever had on two wheels! Anything below ten degrees and my fingers turn white. My toes turn a similar shade too…with a hint of purple right at the ends – not at all attractive and very sore! My chest feels fit to burst and my thighs are burning more than Guy Fawkes on bonfire night. And of course my nose is dripping…constantly! But this is definitely the MOST fun I’ve ever had on two wheels. And this is absolutely, definitely my best ride ever! 3. 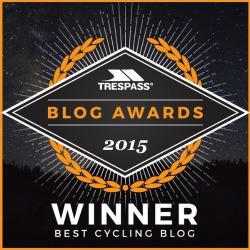 I don’t think ANYONE has EVER cycled so fast up this hill! OK, so some dude just overtook me in his super duper top of the range kit and whizzed wet, muddy road-splatter in my face and I can hear that jogger coming up on my shoulder; but the cyclist obviously had wheels which cost like a gazillion pounds to make him that fast and the runner must obviously be super-human. I have never cycled this fast up this hill. Go me! 4. OMG, you are so ridiculously FAST! If you keep telling yourself something over and over again, I’m sure you’re mind becomes convinced it’s fact. This girl can and will do it! 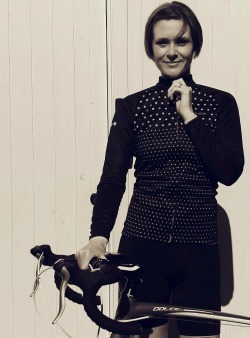 So some days, on the Nottinghamshire country roads, I’m Lizzie Armistead and no one can see me for dust! Honestly! 5. You’re ALWAYS faster than you think you are! Well, certainly faster than those couch potatoes sat at home watching back to back weekend cookery shows. I’m doing this and I’m doing it well (in my head at least)! 6. I’m so nearly finished! What do you tell yourself that gets you through that longer-than-expected ride or up that humongous looking mountain, erm, I mean hill? 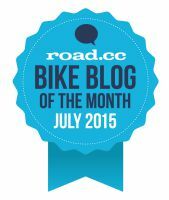 Share the post "Six Things I Tell Myself Whilst Cycling"
I like to have a Sportive booked up which gives me something to focus on and something to ensure I get out on my bike and train! It’s easier to head out in the bad weather when you have something to work towards. Usually a min of 2 of us make a pact to go out regardless, that way it makes it easier as neither of us wants to let the other down. When things get tough out there in the driving wind and rain, when my legs are screaming at me and my chest aches, I think of why I’m doing this……. I’m doing this for the Beatson Cancer Charity, to raise vital funds for them. I think of those going through treatment for cancer and their battle……… it makes my battle with the wind and rain nothing in comparison. Having a training target definitely helps and working with others is a brilliant tip; you are so right that if you’ve made a pact to go out with others, you are far less likely to let them down, especially if there are only two of you. Good luck with your fundraising for the Beatson Cancer charity. It sounds like a brilliant cause. Training for an event where you’re fundraising is certainly great motivation. I do that too, especially on a longer ride; I try to break it up into shorter sections which (usually) makes it feel much more manageable! During the winter months I tend to opt for shorter 30-40 mile rides apposed to longer 60-80 rides, and usually scrap the cafe stop as nothing worse than getting cold and wet, stopping for a bite to eat then trying to get started again when your body has cooled down. Yesterday I found myself with two options – over a small hill, or a slightly longer route around it. The decision process ended up being “you ate loads of pizza last night, you need to go for the climb to make up for it!”. And then my mtb refused to change into small enough gears, so that made life slightly more difficult. Oh well! Definitely worth it to come back down the other side. In the winter /winter months I select routes that will be less likely to be flooded as Hertfordshire’s sunken lanes are very susceptible to this. I also tend to do shorter rides, but unlike Stu I always still have a coffee stop (ride for tea) albeit we make it briefer so we don’t cool down too much. Having a commitment to ride with my cycling buddy definitely helps get me out the door on the worst of days. So I’m grateful that he’s recovering well from his knee replacement. Lots of little sub-goals help along the way and I also love the outdoor feeling once I’m there & warmed up. Finally I say it’s important that I’m dressed in the right gear as I don’t like to be cold!!!? Sub-goals are a great motivation. And being wrapped up cosy is an absolute must for me. I just wish I could find some gloves to keep my Raynaud’s at bay! I bought them this year at the Etape Caledonia and they’re the best gloves I’ve every had. Keeps my hands warm and dry and are not bulky in the slighist. I’m sure I paid £26 buy I’d imagine you’d pick them up cheaper online. Even at that price I’d happily pay it again. I plan on writing a review on them shortly. Thank you for the recommendation, Stu! I will definitely take a look at these. I’ve not found anything that has worked yet and it seems to get worse each year. 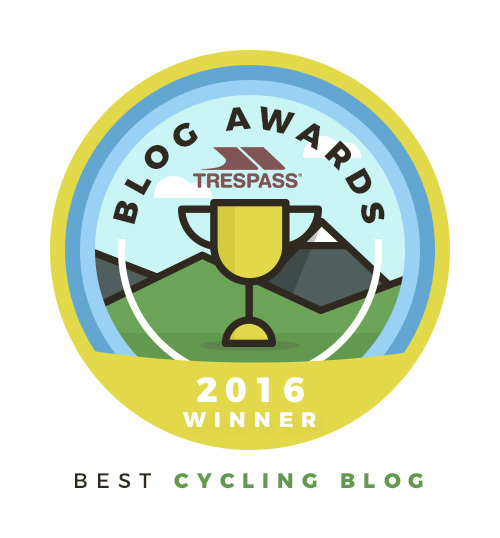 Last winter, I really struggled to cycle because of it – I just couldn’t feel the brake levers and the pain was just awful! So, I am definitely on the look-out for gloves that can help (and overshoes if I’m honest!). The fact that these aren’t too bulky holds massive appeal. I can’t wait to read your review! I’ve been on the hunt for years for warm and waterproof gloves that aren’t bulky and never found any until I came across the Endura one. The Etape Caledonia was torrential rain and wind and at the end of the 81 miles a lot of the boys from our social group were complaining that their hands were so cold they couldn’t operate the gears or the brakes properly. 3 of us bought the Endura gloves that day and our hands were warm and dry and could operate the brakes and gears no problem. For gloves I have some SealSkinz that keep my hands toasty on all but the coldest days. When that happens I add some thin thermal gloves underneath. For cold feet decent overshoes are part of the answer and the best I have found are the Gore-Tex ones offered by Gore Bike Wear. The neoprene ones just get wet and then cold. On a JOGLE in October a few years back my mates had neoprene and moaned of cold wet feet while I stayed warm and dry. The other thing to use is a thick woolen sock. Thanks very much for the tips Tom; great to hear about the Goretex overshoes and how good you found them during your October JOGLE ride. Congratulations on completing the ride, which I’m sure isn’t easy at any time of year but especially as the Autumn/Winter season starts to set in. Ahh, so pleased you could relate to it Jade and that it made you chuckle. Happens to the best of us, hey! I hear you on the hills! And is it wrong to have favourite hills, or at least ones I prefer to cycle up than others? Absolutely not. My favourites are definitely the ones I make it up!